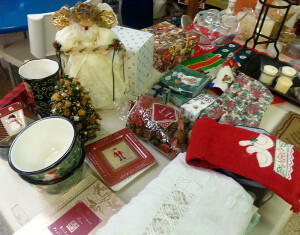 A preview of the items for sale at “Grandma’s Attic” at The Hickman Annual Holiday Bazaar, which takes place this weekend, Dec. 5 & 6 in West Chester. WEST CHESTER — If you’re looking for a unique holiday shopping experience in the heart of West Chester, stop by The Hickman’s 15th Annual Holiday Bazaar on Friday, December 5 and Saturday, December 6. Items available for sale this year include crafts and knitted pieces handmade by our residents, baked goods, jewelry, plants and many other treasures, including select items from The Hickman’s “Grandma’s Attic” collection. The Holiday Bazaar is run by residents, staff and volunteers at The Hickman Friends Senior Community, a 124-year-old independent and assisted living personal care residence for older adults in West Chester. The proceeds from the two-day event benefit resident activities. The Holiday Bazaar will take place from 9 a.m. to 2 p.m. on both Friday, December 5th and Saturday, December 6th at 400 North Walnut St, West Chester. Admission is free and open to the public. The Hickman Friends Senior Community, established in 1891, is conveniently located two blocks from downtown historic West Chester. A nonprofit licensed personal care residence, The Hickman serves individuals on an equal opportunity basis in the Quaker spirit in which it was founded. For more information, please visit www.thehickman.org or contact Eliza Mohler at emohler@thehickman.org or 484-760-6413.